Oh no! It's another New in Chess mailing! A treat indeed, I'm sure, certainly if it's as much of a treat as "Dirk Jan ten Geuzendam's brilliant essay", which only "did something that needed to be done" in the sense that without it, pages 12-27 would have been empty save for adverts. Still, hurrah for Dirk for facing "all the nasty issues". If only he had. It would have been a novelty to match anything in Informator. But on to the treat. We have just received a new book which enables us to once more embrace Bobby's marvellous chess. Good-oh, but I have several books already that might assist me there. What's special about this one? 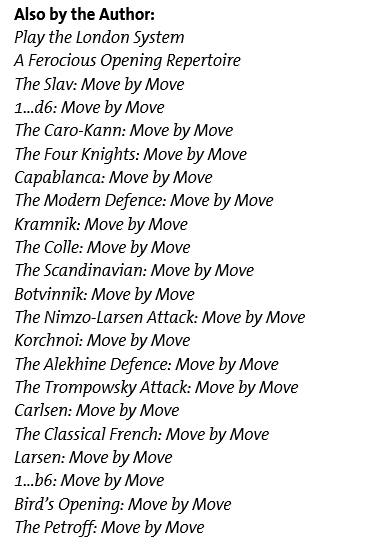 All right, people (in this instance Allard Hoogland, of the New In Chess Online Shop) have to do the job they're given, they can't just say "I assure you, we have ten thousand titles in stock that are better than this one". 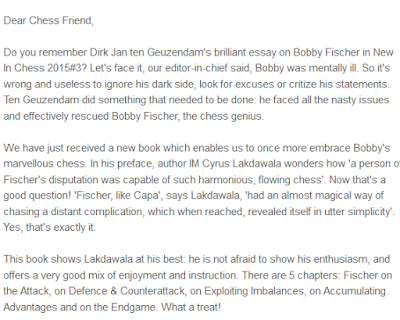 So let's generously assume that Mr Hoogland knows that Cyrus Lakdawala is actually the worst chess writer currently practising (we assume Andres D Hortillosa has mercifully retired) and that the phrase "this book shows Lakdawala at his best" was judiciously selected and that it could mean "all of these..."
That's quite unfair of me, when I haven't even read the book he's talking about. Nevertheless I have read the sample pages kindly (and unwisely) provided by the publisher, Everyman, which may be more than Mr Hoogland has done, since he claims the existence of five chapters - whereas the sample pages promise six. The sample runs to a generous - or perhaps I mean onerous - twenty-four pages and to go through every issue I can find, just in those two dozen pages, with Lakdawala's written English, his habit of filling paragraphs with waffle and babble, and his numerous other poor writing habits would take rather longer than it's intrinsically worth, but here's a few lousy apples from the bargain-basement barrel. 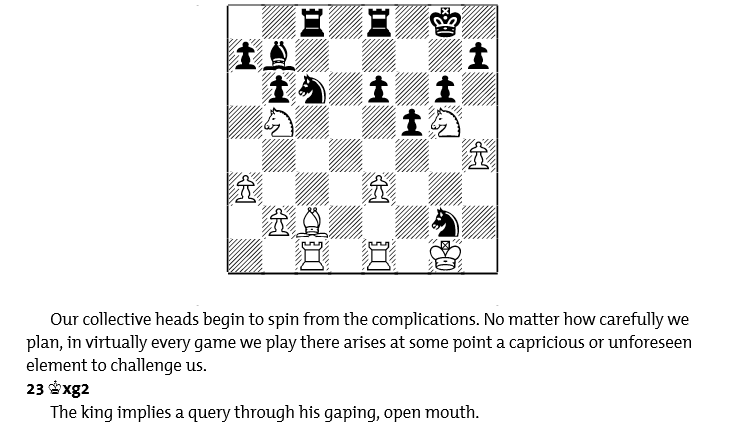 ...he bent our perceptions on how well a human can play chess. "Perceptions on? Does Lakdawala mean of? Would you? Did either Taimanov or Larsen suffer in that way? Larsen boasted that he wasn’t intimidated by Fischer, who he felt was cocooned by an undeserved legendary reputation. The reputation was "legendary"? Since the reputation was real, does Lakdawala mean something like "as a legend"? Also, does he really mean "cocooned"? Who knows? 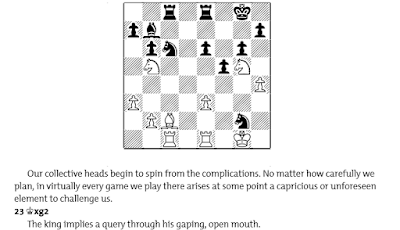 ...his future opponents, Petrosian and Spassky, imputed hidden meaning into even his ordinary moves. We don't "impute into", do we? This book, unlike other players' games collections, lacks a broad demographic cross-section of opening lines. What does Lakdawala imagine "demographic" means? In Fischer-Myagmarsuren 1967, Bobby just challenged precedence with 13 a3!! What purpose does "telepathic" serve here? 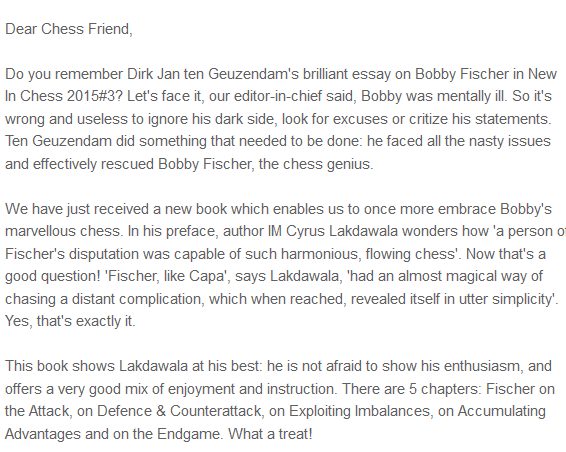 In what sense might Fischer's "intuition" be "telepathic"? Why not just say "intuition"? But only almost, since Nietzsche would probably have been able to spell his name properly. you may be inclined to think, with Dr Johnson, that there is no settling the point of precedency between a louse and a flea. Or maybe he meant "precedence". "the worst chess writer currently practising" - Ray is very upset at his loss of reputation and he will certainly be crossing you off his Christmas card list. I'm not sure I regard Ray as currently practising. When he says "quote", does he mean "quote? He must do, because he supplies a passage in quotation marks, but if that's so, who said it? "Some GM"? Which GM? If you can't tell us, how reliable is the quote? Ok, most of your other criticisms seem true. These however just seem like you are trying not to understand. Is it envy? Please. I can tolerate and even enjoy endless Penguin and Nosher bashing. But I can't enjoy Lakdawala-bashing. (Sure, as you point out, that book needs work. I just can't enjoy Lakdawala-bashing. He's a writer hero of mine.) Anyway. I feel my suspicions are justified when you resort to stuff like those 2 bits I quoted. Your criticisms of them are silly and unworthy of this great blog. If they're silly, it should be simple enough to say why.